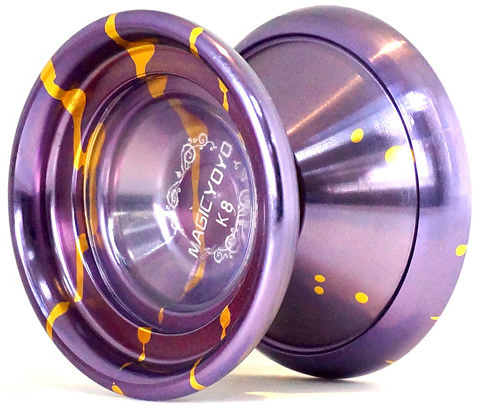 The K8 Magic Yoyo is a butterfly shape and slightly inverse round shaped. It has pronounced rims, adding weight to its aluminum body. This makes for an extremely stable yoyo that can move through string tricks without wobbling. The K8 is a full-sized with a large body size to land advanced sting tricks. Another feature of the K8 you don’t typically see on yoyos are plastic cap inserts for finger spins. Please note this is a NON-RESPONSIVE Yoyo.This means a bind is required to wake the yoyo up. If you do not want to learn or know what a bind is, or the person you are buying it says he cannot perform a bind, then this is not the yoyo for you.